We've been having a relaxing couple of summer weeks here. It is so cliched to talk about the weather, but it has been so lovely and unseasonably cool here. Highs in the 70's... In mid-July, in Missouri! Amber has actually felt like playing outside and didn't end up sick after 5 minutes. On the health topic, Amber has been doing great with her food. We did the trial of Sucraid, but it didn't really have any effect on Amber except to make her a little quesy one time. Amber was finally given an appointment for this coming week to see the neuroscience specialist recommended by the GI doctor to track down her exhaustion, overheating, and dizziness. Playing outside and being silly. (Bottom-Right) Math at the car dealership. I love my Volvo, but the regular maintenance takes forever. It was a total of 6 hours Thursday for our drive to the dealership and the wait. We are about two weeks away from the official start of our new school year. Amber has been working on math all summer though and we have found a good balance to lower her math stress. Math causes anxiety for our little perfectionist. We have our homeschool co-op enrichment classes all lined up and the lesson plans are complete for all of our regular subjects. I even have some plans going for the classes I'm teaching at the co-op. If you are interested, I did update our curriculum page for this school year. We have really pared back our subjects and curriculum. I'm excited to see how this works for Amber. (TOP)Build-A-Bear fun (BOTTOM-LEFT) Kinetic Sand... Amber tolerates this feeling and it helps as a sensory activity. (BOTTOM-RIGHT) Another new LEGO kit. After many baking sessions in June, I've felt burned out this month. I need to get back to making more than Amber's bare necessities. The problem is that pasta is next on the list. As far as I can find, all the wheat free packaged pasta has either brown rice or soy. One brand makes a white rice spaghetti, but no macaroni or any other pasta. My job is to cobble together a pasta recipe that Amber can tolerate and test it as the easier to make spaghetti before I buy a pasta extruder to make macaroni and other round pastas. Therein lies my reluctance. That and I'm just tired. 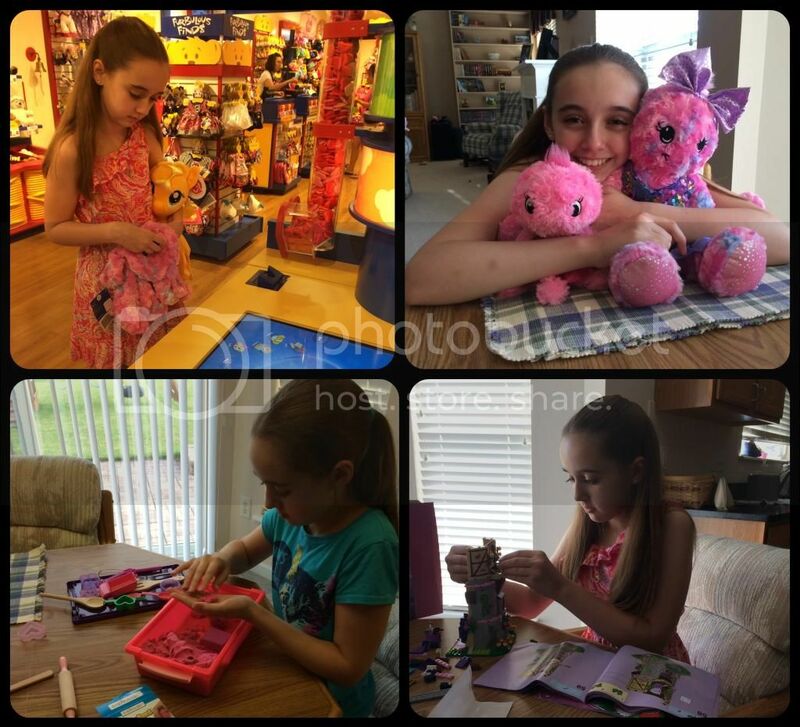 We have been working on lots of little organizing and decluttering projects at home. I'd like to know who authorized all the stuff I keep finding in my house. Surely, it couldn't have been me. At some point soon the playroom has to move across the hall, but the destination room is not even remotely ready yet. That room still looks like a guest room that the cats think is their personal space. I also need to start acquiring bedroom furniture for the soon-to-be-old-playroom and finish the painting of existing furniture. We are also working on decluttering Amber's bathroom and hope to have that finished this weekend. Alterations of the school area are progressing as well and I hope to have the majority completed by the time school starts. The school area isn't being changed a great deal; we're mostly trying to make it more easily adapted to two children instead of personalized for a single girl. 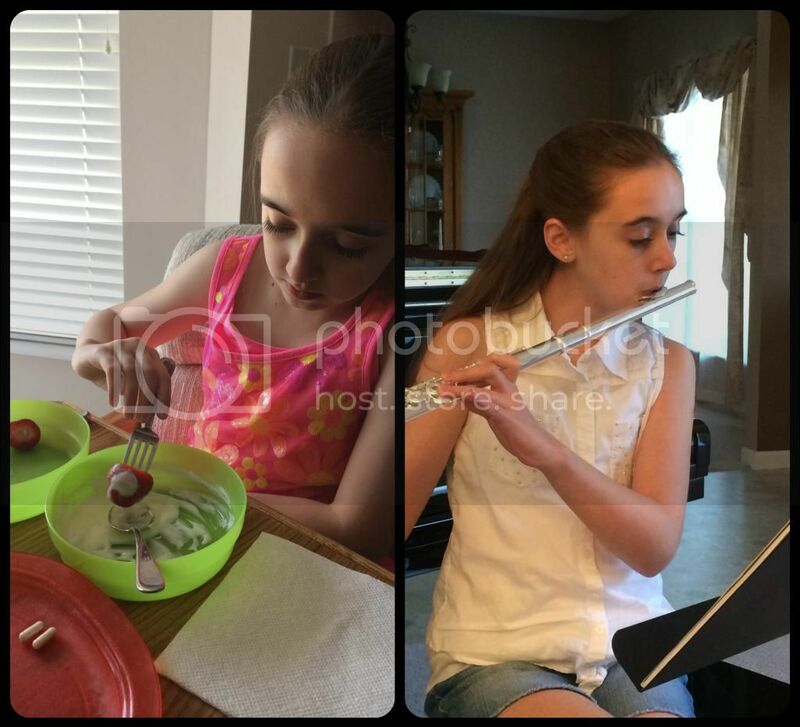 (LEFT) Strawberry with plain greek yogurt (RIGHT) Flute practice. She has moved to longer lessons each week, and so practices more each day too. There is an update on our adoption status, however it needs to wait a bit before being published. I'm feeling much more at peace right now though. Today Amber and I did a bit of shopping, playing together, and just resting. Our temperatures are supposed to become more seasonable next week, so we are trying to make the most out of the remainder of the mild and tolerable weather. Shopping with Grandma too. We love to try on the masks. It's so much fun! She looks like she had such a happy week!!! I really like the masks particularly the elephant on and the cats that I see in the background. I ended up reorganize most of the house to fit Margaret in to our homeschool. The old room was just too small. It's good to see Amber so active and feeling good. You are one dedicated and determined mom to attempt all those baking projects. I don't think I could do it. You really do amaze me. I can understand how you would get a little tired and burnt out over it. I'm glad things are moving right along with the adoption. I was wondering if you'd be able to homeschool your adoptive daughter and you answered that question in this post. I had no idea how that worked, but am glad you can! I hope things will keep progressing smoothly for you. I am glad Amber had such a great week. I totally understand your reluctance to test the pasta. I hope it goes well when you do. I was wondering if you were going to homeschool you new child. I thought you might. This is such an exciting time for your family. Praying it all comes along smoothly. I know the waiting is so hard. Yes we do intend to homeschool our new child, but it all really depends on what is best for her. It also depends on some other factors that will become clear in a few weeks. 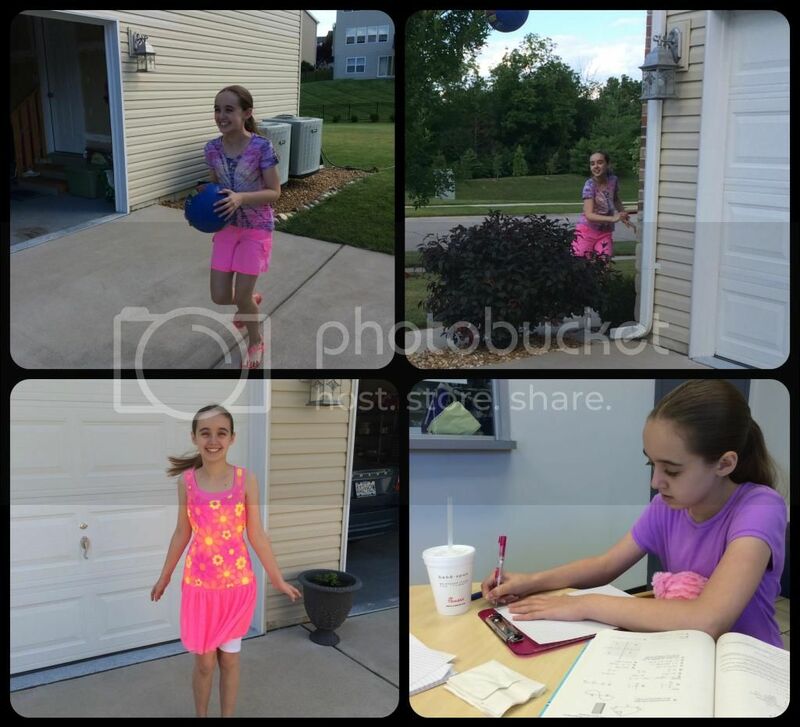 Still, even if she is not able to be homeschooled right away, we need a place for her to work on school assignments. Still, I can't imagine telling a new child that she has to go off to public school while I am keeping Amber at home with me. I am so glad Amber enjoyed the cooler temps. It was cooler here too and was so strange because it is July, in Alabama! I am so sorry about how hard it is to cook and find things Amber can tolerate. I know that is a huge stress factor to you both. I'm so excited about all the remodeling and mainly for the REASON for it! Prayers that it all works out beautifully. 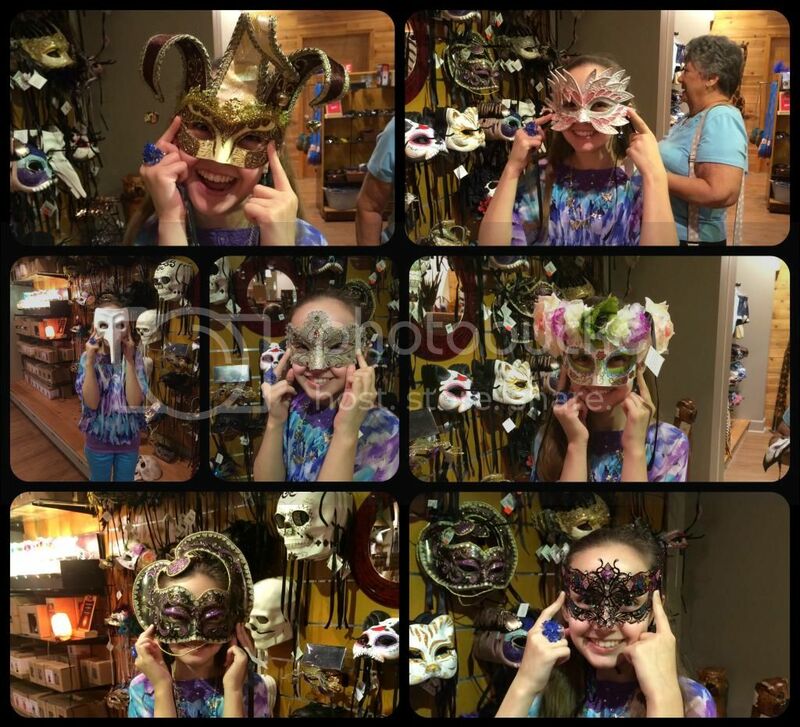 Amber is just so involved in so many things and I LOVE the masks pictures. Keilee loves masks too. Happy week Christy!